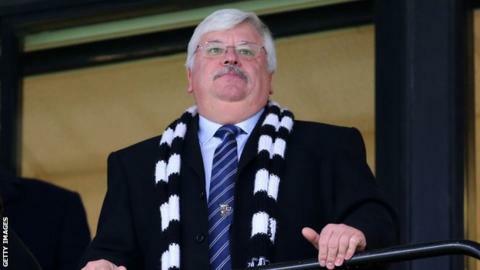 Port Vale chairman Norman Smurthwaite has reversed his decision to give Stoke City fans another stand for their Checkatrade Trophy Potteries derby. After Stoke sold out a 4,000 allocation to see their Under-21s at Vale Park, Smurthwaite promised them more tickets. But after Vale fans objected to giving City a 'home stand' for the last-32 tie on 4 December, Smurthwaite relented. "I'm sorry for any heartache, pain and grief that people have had over this decision," he told BBC Radio Stoke. In a statement on the club website, Smurthwaite added: "I have felt the pain and anger expressed by so many of our fans directly to me via social media. I understand the emotional and historical value of where fans choose to sit. "I think it is fair to say that nobody expected Stoke City's allocation to be sold out, and so quickly, which had left us with an operational issue with regard to stopping additional Stoke fans purchasing tickets within our home area. "I can now confirm that no further tickets will be made available to Stoke City FC and I apologise to any Stoke City fans that had expectations to come to the game following our announcement on Saturday evening." Vale still face being outnumbered by visiting fans for the match - as of last weekend, only 300 home tickets had been sold.